This popular dairy-free and vegan mushroom soup is easy and super tasty. It doesn't require any fancy equipment, just some slicing, dicing, sauteeing, and heating on the stovetop. 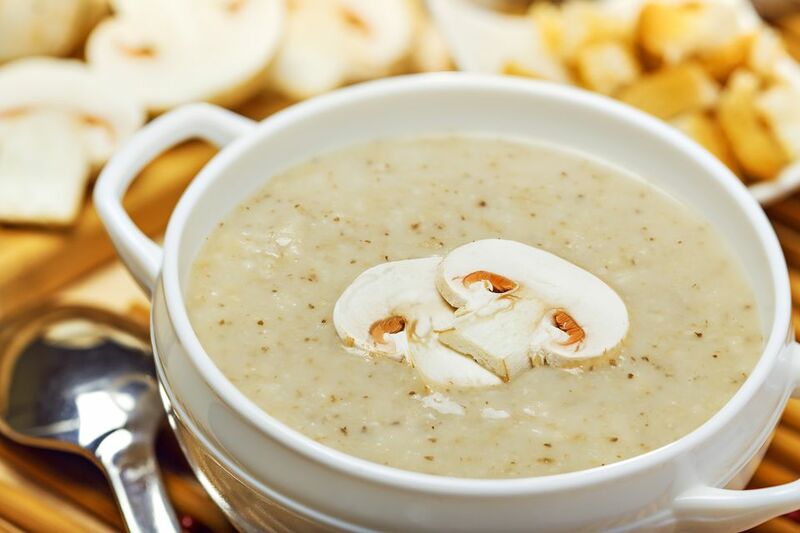 If you want or need this simple homemade mushroom soup recipe to be gluten-free as well as vegetarian and vegan, there's an easy solution. It does call for flour as a thickener, but you could just as easily use an equal amount of cornstarch dissolved in about 2 to 3 tablespoons of water. Use this mixture to thicken it up and keep this cream of mushroom soup completely wheat-free and gluten-free. Also, check to make sure that your vegetable broth is gluten-free as well, as some are, and some aren't. It's also very easy to make your own homemade vegetable broth. That way you'll know exactly what is in it. Slice the mushrooms, dice the onions, and mince the garlic. In a large soup or stock pot, saute the mushrooms, onion, and garlic in vegan margarine for 3 to 5 minutes, until onions are soft. Reduce the heat to medium-low and add the vegetable broth. Cover the pot and allow it to simmer for at least 45 minutes. Add the flour (or use cornstarch mixed in water to keep it gluten-free), non-dairy sour cream, and soy milk. Stir the mixture well to combine. Allow to simmer another 20 to 30 minutes, or until soup has thickened. Try any type of mushrooms you like best. Exotic mushrooms will likely have a stronger taste than button mushrooms. You can serve this simple vegan cream of mushroom soup as a meal-starter or enjoy it for lunch or a simple dinner. Pair it with a side green salad and enjoy it with some crusty bread. You can make this ahead of time if you are going to be serving it to guests. In fact, the mushroom flavor should intensify if you allow it to chill in the refrigerator overnight. Use leftovers within three or four days of preparation. This soup also freezes very well. Feel free to double the recipe and freeze either a big batch or individual sized portions. Defrost and heat up for a quick and tasty lunch or dinner. If you like making homemade vegetarian and vegan soups, go ahead and make some more like these 10 fat-free vegan soups or these 7 easy vegetarian soups to make in your crockpot.